How to pay LIC Premium Using BHIM UPI App. Bharat Interface for Money which is also called ‘BHIM’ is a platform which uses ‘Unified Payments Interface’ (UPI) to quickly transfer money in simple and easy steps. Life Insurance Corporation of India (LIC) has recently introduced the facility to use BHIM UPI interface to pay LIC premium which has certain unique advantages over other payment methods. Before understanding the method to pay LIC premium using BHIM UPI interface, let us learn how to set up BHIM app in your smart phone. BHIM UPI interface – important points to remember. BHIM is a digital payments solution app based on Unified Payments Interface (UPI) from the ‘National Payments Corporation of India (NPCI)’. BHIM app is now available for Android and ios (Apple iPhone users) only. Windows, Java and symbian phones are not supported. If you have at least one bank account, which is also linked to your mobile number, then you’ll be able to use the BHIM app. The person or merchant to whom you’re trying to pay money using BHIM, doesn’t necessarily need to be on the BHIM app. All they need is a bank account to receive the payment. If the merchant or person to whom money is to be transferred has an already activated UPI, you can just ask for their VPA or virtual payment address, and just make a payment to that account. Virtual Payment Address (VPA) is your address for receiving and sending payments, which looks like an email id and can be seen in the profile section of your app. Generally it is ‘your mobile [email protected]’. Step 1 : Install BHIM App from Google play store. Step 7 : Your account is now registered and ready to use. Send or request money and go cashless. Now BHIM – UPI app is activated on your mobile phone and it can be used to transfer, make payments and receive money in simple steps. 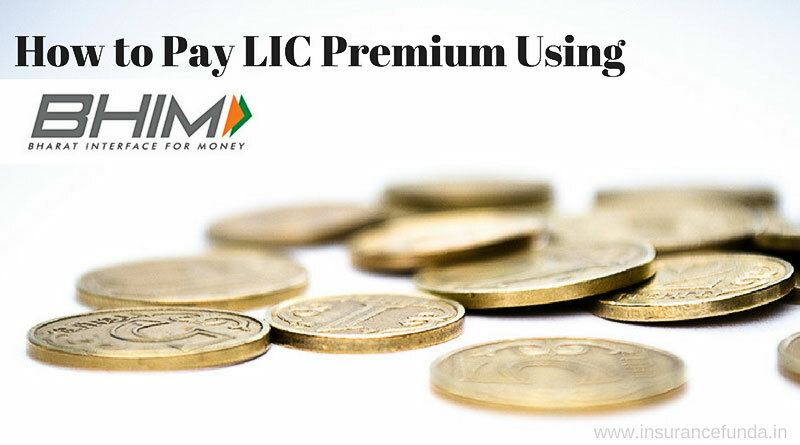 Now let us have a look at the method to pay LIC premium using BHIM. How to pay LIC Premium using BHIM UPI App. Premium payment through ‘BHIM UPI App’ is done through the website of LIC of India. Please follow the steps given below. Open the website and locate the link ‘Pay Premium Online’. Click on the link to open it. If you have already registered for the e services, use the ‘pay premium through the e-services link‘. It is always recommended to use e- services for premium payment as you can easily track your payments and the status of the policy. Otherwise select ‘Pay Direct‘ link. If you are using Pay Direct link the payment is done in three steps as shown in the info-gram. First step involves customer validation to verify the policy details to which you are paying the premium. Second step shows the validated premium details. The payment process is done in the third step. These steps are arranged as tabs as shown in the info-gram. For those who have already registered for LIC’s e-servies, login to the portal using your credentials such as user ID and password. Once logged in, you can select ‘Pay premium online option’. Select the policy for which you wish to pay the renewal premium, by checking the tick box and click on ‘Proceed to pay‘ button. The next screen will shows the payment options available. Click on either of the UPI Payment option buttons as shown in the info-gram given below. Enter your VPA and click ‘submit button’ before the link expires. You will receive a notification in your already installed BHIM UPI app. Open the App and click on the notification as shown in the image. All the information regarding the proposed payment will be shown in the app. If you are satisfied with the information provided, you can authorise the payment using the UPI PIN already created by you. Amount will be deducted from the linked bank account and notifications and message on the successful transaction will be received. Advantages of using BHIM UPI for sending and receiving money. You can make direct bank payments to anyone on UPI using their UPI ID or scanning their QR with the BHIM app. No need to register the payees as required in bank based fund transfer. Very easy to set up and very simple to use. No need to share your bank account to the person sending the money. It is absolutely free, unlike credit card and debit card transactions, where a convenience fee is charged. The BHIM app don’t save any information except the account name and phone number, hence it is much more secure. All process happen from the banks. Charges Applicable to Credit and Debit Card transactions on paying LIC Premium. Payments through BHIM UPI app is absolutely free, where as charges may be applicable for other payment modes. Please refer the chart given below to understand the charges applicable for Credit/Debit card transactions.